I knew that Crawford was a very driven person yet I hadn’t realized the extent of her ambition and what she was willing to compromise in pursuit of fame. Stephens College president, James Madison Wood, wrote an unpublished memoir, which is in the library archives. In it, he relates an account of his reunion meeting with Crawford in 1926, four years after she left Stephens. After visiting Crawford at her extravagant home, they dined at the Biltmore Hotel in downtown Los Angeles. Though she was still quite young and in the earliest days of her career, Crawford expressed a cynical attitude about the empty, superficial life she was leading. It’s sad to think a person would have such a dim view of their vocation and yet continue doggedly to pursue it for another 50-plus years. What did you not include in the exhibition that you wish you could have? We included a scrapbook a Stephens student kept while Crawford was enrolled at the college. I think it would have been great to digitize the full scrapbook and make it available on a gallery-dedicated tablet for visitors to peruse. It’s my hope we can still digitize the scrapbook and make it browsable via the college library website. I also would have loved to include more letters and materials from the archives to create a fuller picture of Joan Crawford’s relationship with the college president. This too may be a project for the future. A page from 1920s scrapbook displayed in the exhibition. Photograph: Katherine Craig. Scrapbook from Stephens College Library Archives. How did students participate in the organization of the exhibition? Students were involved in nearly every phase of the exhibition. Katherine Craig (’18) photographed the exhibition, assisted with installation, and served as the exhibition’s graphic designer. Cierra Bergan (’18) and Jasmine Meurer (’17) of the student marketing firm, Creative Ink, handled the marketing materials. Allison Moorman (’18) took object photographs prior to the exhibition opening and Janet Reinschmidt (’18) and Erika Westhoff (’18) provided library support. One of the things I love about working in college and university museums is the tremendous support we receive from students! Who did the illustration on the wall when you first walk in the exhibition? Why aren’t there more garments on exhibit? At many larger institutions exhibitions are planned out 3-5 years in advance—and these are museums with a full staff! We are a small operation with no full-time staff dedicated to the museum, which means we have to accomplish quite a lot with very few resources. The textile conservator’s rule of thumb advises allowing approximately one full day to dress each mannequin. This is because the mannequin or form should be altered to accommodate the clothing and not the other way around as would happen in a clothing store. Of course, sometimes the dressing process takes more or less time depending upon the condition of the objects and what kind of preparations are needed, such as cutting back or building up the form. In the case of the Letty Lynton gown, for example, we had a mannequin on hand that well accommodated the garment yet the gown itself required a great deal of preparation. It is made of cotton organdy and much of the starch had been washed out over the years. Moreover, it had been stored flat, which meant that it was very wrinkled. We could have added starch to it but that would have meant making an intervention on the garment potentially compromising its preservation and historical integrity. I dedicated a full work day to steaming the gown while it was on the mannequin. Yet without starch, the gown drooped sadly on the mannequin so I built out horsehair supports to give the gown fullness at the shoulders and skirt hem. Given the short turnaround time—about 6 months from research start to installation finish—and my other responsibilities as a college professor, it simply wasn’t possible to dedicate time to dressing additional mannequins while maintaining best museum practices. If someone wanted to do research in the collections, how would they go about doing that? Why did you decide to include a movie poster for “Mommie Dearest” (Perry, 1981)? Much of what is addressed in the movie has been disputed. And besides, doesn’t it take away from the exhibition’s focus on Joan Crawford’s glamourous public persona and her impact on fashion? The decision to include the Mommie Dearest poster was the result of much consideration. One of the catalysts for curating the exhibition was the FX television anthology Feud (2017). The series is inspired by Shaun Considine’s Bette and Joan: The Divine Feud (1989), which explores the relationship between Bette Davis and Joan Crawford before, after, and during the making of Whatever Happened to Baby Jane? (Aldrich, 1962). The series’ producer, Ryan Murphy, aims to tell a more nuanced story of their rivalry and sometimes collaboration than has often been told. He frames their antagonism as the direct result of being powerful women operating within a misogynistic culture. In episode 3, called “Mommie Dearest,” the show explores the rumors swirling about both Davis and Crawford’s bad parenting and aims to demonstrate they were neither evil nor perfect. The episode seems to exonerate the two women as complex people who were doing their best to balance high profile careers with lives as single parents. Feud received a great deal of attention when it came out. I knew it would reignite interest in Joan Crawford, including among people who have never seen a Joan Crawford film. Our gallery is part of a college and I knew many visitors would be young people. In talking with my students, I learned most had never seen a Joan Crawford movie. 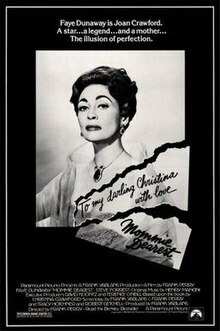 I even had some students tell me that Mommie Dearest was the only Crawford film they had ever seen! Mommie Dearest is a fictionalized account about Joan Crawford starring Faye Dunaway and I wanted to set the record straight. Moreover, the legacy of Joan Crawford in popular culture cannot be completely dissociated from her Hollywood career. To deny the unfortunate transformation of Joan Crawford’s star image that occurred after her death would be to deny a piece of the larger picture. I understand there are some diehard fans who would prefer to excise from history Christina Crawford’s unsubstantiated negative depictions of her mother but the fact is, true or false, the daughter’s words have irrevocably changed the way we think about Joan Crawford. The young people who conflate Faye Dunaway’s performance with Joan Crawford are proof of that. I felt it was more honest to acknowledge Mommie Dearest in the exhibition and to clarify for those who might not realize Faye Dunaway’s camp performance was not Joan Crawford and that the film may not even include accurate depictions of her life. That being said, Irene Sharaff’s costumes for the film—Faye Dunaway’s insistence on Private Benjamin (Zieff, 1980) Goldie Hawn hair notwithstanding—are absolutely stunning and well capture Joan Crawford’s glamorous look.